The Secretary General of the Council of Ministers d. Mahdi Al-Alaq The new government has taken the same approach to dealing with humanitarian solutions to the file of the return of the families of Dahesh, putting priority on dealing with this matter in accordance with the vision of rehabilitation psychologically and intellectually and integrating them into society after confirming their response to rehabilitation. 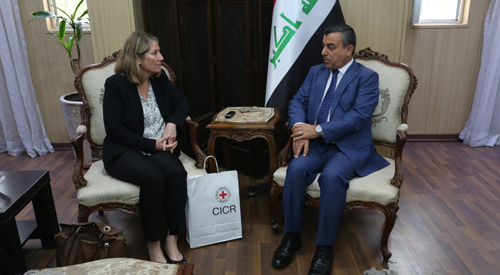 This came during his meeting with the head of the delegation of the International Committee of the Red Cross (ICRC) in Iraq, Ms. Katrina Ritz and her accompanying delegation, Ms. Karen Ben Yahia, ICRC Protection Coordinator. He pointed out the need to coordinate joint action with all sectoral ministries and local governments to secure the stability of the liberated areas. Mrs. Katerina highlighted the activities and activities of the mission in Iraq and praised the efforts of the Iraqi governmental institutions and their great cooperation with the mission to provide the best services to the residents of the liberated areas. During the meeting, she handed over the final report on the work procedures and how to deal with the return of the families of Daash, Stressing the importance of dealing with this security issue within the framework of legal and peaceful coexistence and provide support by local governments and tribal groups and give the opportunity for families to integrate into society. The Secretary-General also handed a commemorative gift of a photographic brochure of the most important humanitarian tasks carried out by the International Red Cross for various periods and in the country since 1860 in appreciation of his exceptional efforts in supporting the work of the Mission.